Planning a party or an event? Salmon’s sells in bulk at a cheaper rate! Call ahead to order yours today! Due to the fluctuation in beef and pork prices, our prices change frequently. Give us a call for the most up to date prices! 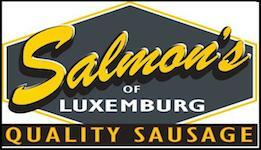 Interested In Getting Salmon’s Products Shipped To YOU? CONTACT RON’S WISCONSIN CHEESE FOR PRICING AND DELIVERY OPTIONS!